Majestic guardian of a rich family history, Villa Fanny will astound you with its warm and welcoming atmosphere and captivate you with the intimate elegance of its rooms: a unique spot in the urban landscape. 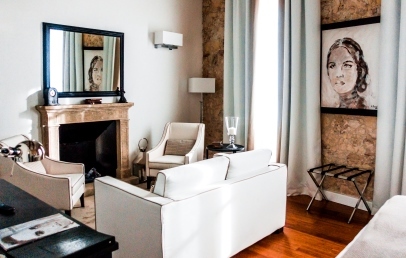 Hotel Villa Fanny is located in an exclusive residential neighbourhood in Cagliari, a pleasant stroll from the old town centre with its museums, monuments, bars and restaurants. The villa is situated in one of the city’s most interesting archaeological areas, a stone’s throw from the Roman Amphitheatre, the Villa of Tigellius, the Botanical Gardens, the Garden of the Capuchins, and the Punic Necropolis of Tuvixeddu. Elegant indoor spaces, welcoming relaxation areas and impeccable service, Hotel Villa Fanny embodies the passion that has been the guiding light of the owners of the residence for generations. This passion has spilled over into the ancient splendours recovered thanks to expert restoration works. The leafy garden envelops the villa, almost as if safeguarding its stillness and concealing its secret of outstanding hospitality. 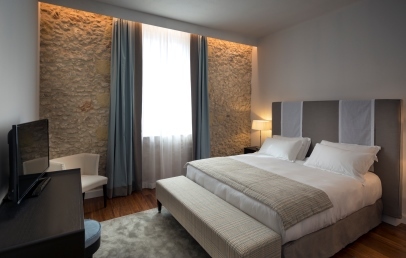 The 18 rooms at Hotel Villa Fanny all feature an understated and elegant style, and bring together the refinement of the furnishings with the enchanting traces of the past, preserved thanks to the skilful restoration works. All rooms are sound-proofed and have Wi-Fi connection, Wi-Fi speakers, LED TV with satellite, mini bar, safety box, air conditioning, memory foam pillow top mattresses, slippers, bathroom with shower cabin, heated towel rail and hair dryer. Comfort – 22 sq.m., double bed, 32'' LED TV with satellite programmes. Luxury Double – 30 sq.m., double bed, 40'' LED TV with satellite programmes. 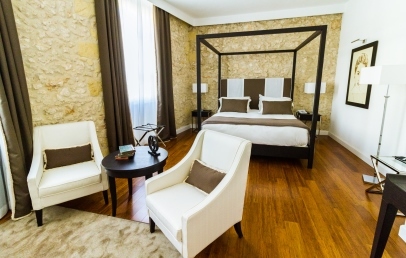 Suite Ercole – 30 sq.m., double bed, living room, walk-in wardrobe, 40''LED TV, garden view. 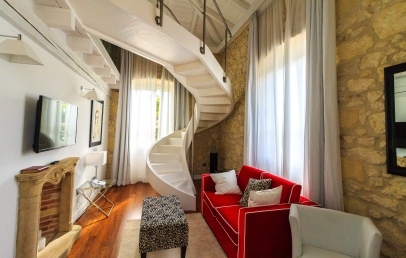 Suite Fanny – 34 sq.m., double bed, living room, walk-in wardrobe, two bathrooms, Finnish sauna, sensory shower and Turkish bath. Breakfast and free Wi-Fi connection are included in the room rate. A love of sharing brings to life evenings at Villa Fanny with events, readings, chamber music concerts and live music. Intimate and welcoming rooms, comfort rooms have parquet flooring and double beds. 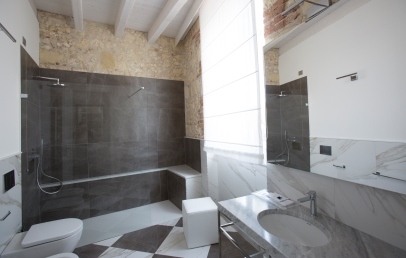 Some comfort rooms offer exposed wooden beams and trusses. The rooms offer all mod-cons: sound-proofing, Wi-Fi connection, 32” LED TV with satellite channels, Wi-Fi speakers, safety box, air conditioning, mini bar, memory foam pillow top mattresses. Large and bright, luxury rooms feature an elegant design and a warm and welcoming ambiance. All rooms are sound-proofed and offer the latest mod-cons: Wi-Fi connection, 40” LED TV with satellite channels, Wi-Fi speakers, safety box, air conditioning, mini bar, memory foam pillow top mattresses. Spacious and elegant, luxury triple rooms offer a double bed and living area with sofa-bed. With a high level of attention paid to every detail, rooms feature all the latest mod-cons: Wi-Fi connection, 40” LED TV with satellite channels, Wi-Fi speakers, safety-box, air conditioning, mini bar, memory foam pillow top mattresses. 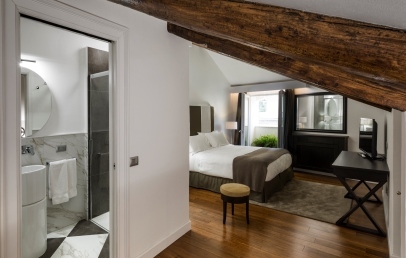 Exposed bricks, parquet flooring and white wood beams, the suite is split over two floors and features a warm and welcoming design. 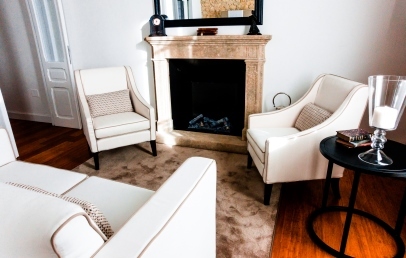 The day area with its ornamental fireplace, sofa and walk-in wardrobe can be found on the first floor while the double bed and bathroom with bathtub and shower are located on the mezzanine. A beautiful room split over two floors, the Fanny Suite offers a bedroom with double bed, walk-in wardrobe and loving room. The bedroom boasts stunning views over the garden and strikes a sophisticated balance between original elements and designer furnishings. 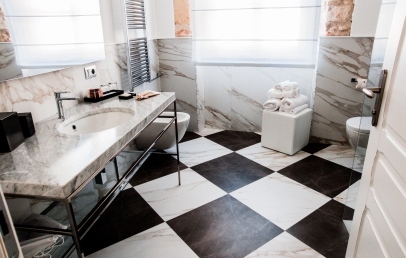 The suite offers two bathrooms: one on the lower floor with a Finnish sauna, sensory shower and Turkish bath, and the other on the upper floor with a bathtub.